Today's favourite photo I found on the internets is the one included above for your convenience. Really, there'd be no point talking about a photo I'd found without showing you what it was, otherwise for all you know I could have been making it up. It's an integrity thing. 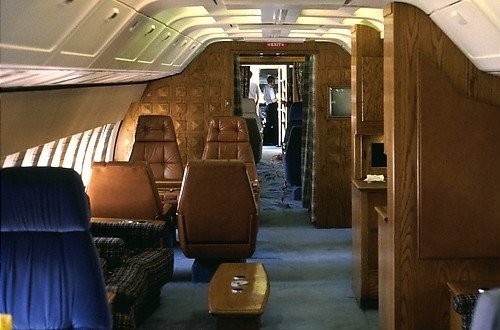 Said photo is by Paul Kippling on Airliners.net of a 707 business jet cabin in Rotterdam from 1983. Why is this aeroplane awesome? The fake wood veneer on the bulkheads and walls; the angular brown leather office chairs; the tartan upholstered couch; the ancient rounded television screen mounted in the wall; it couldn't be more retro if it tried! In case you haven't figured it out, I revel in such retroness. Speaking of which, got a comment from the DOSBox folks.